Emerald Physician Services, in partnership with Sustainable CAPE, Orleans Farmers Market, and Cape Cod Healthcare aimed to do more than improve the health and well being of its 18 FLAVORx program participants. FLAVORx, an acronym for Farmers & Local Health Alliance for Vegetables & Fruit Prescription, was a pilot program that involved 18 low income patients suffering from some degree of chronic illness. The program guided the participants to a drug-free, healthy living alternative driven by knowledgeable professionals, culinary education, and local food access assistance. Emerald Physician’s Medical Director Dr. Kumara Sidhartha, Sustainable CAPE Founder Francie Randolph, and Wholesome Wave and FMC Board Chair Gus Schumacher took inspiration from foundational Wholesome Wave programs around the nation, and adapted the FLAVORx program to impact participants, while also stimulating Cape Cod’s economy. Cape Cod’s FLAVORx program split participants into “experimental” and “control” groups, and was extensively implemented and overseen with approved protocols, health tests and screenings. Education in the form of nutritional cooking classes and local food access were major program components. The “experimental group” participants were given weekly $30 token redemptions to shop the Orleans Farmers Market, a year round market, for prescribed produce while the “control” group received free gas card incentives. 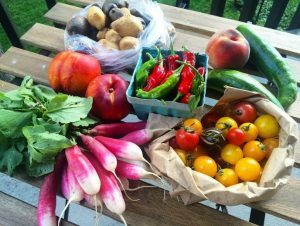 Cape Cod’s farmers markets and farmers were program allies, at the center of health and wellbeing with their fresh, wholesome offerings. By partnering with local foods, the FLAVORx program monitored participants’ health and lifestyle changes while reinforcing the value found and gained through honest, local fare. The FLAVORx program, and programs like it, offer new perspective on health and ways to manage it. There is a lot that goes into maintaining and improving, but maybe an apple a day isn’t a bad place to start. To learn more about the FLAVORx program, check out these two Cape Cod Health News articles here and here.